The inaugural World Men's Singles Championship is taking place in Nice, France. Thirty players, including two Oceania representatives took part in the qualifying round yesterday. Joe Corcoran (Australia) qualifying for the A Division knockout after winning three of his five qualifying games. Mathieu Spinouze (New Caledonia) qualified for the B Division knockout after winning two of his five qualifying games. 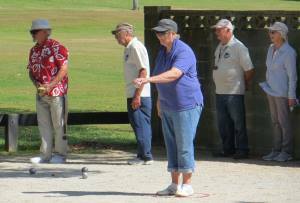 Results from the NZ International Open held at the Herne Bay Pétanque club. Photos to come. Wellington players took out the top NZ team awards. In the Women's Doubles Christine Strichen and Claire Wilson finished first. In the Men's Triples Myles Cowper, Nick Jegousse and Michael Rocks finished third equal. Dylan Rocher (France) beat Richard Nillson (Sweden) 13-1 in the Championship final to win the inaugural Henri Bernard trophy. The bronze medals were claimed by Toufik Faci (Germany) and Khaled Lakal (Tunisia). Australia's Joe Corcoran qualified for the top 16, but was eliminated in the first round of the knockout by Rocher 13-5. The Plate section was won by Benny Bel-Lafkih (Norway) who beat Mathieu Spinouze (New Caledonia) in the final. Full results can be found on the FIPJP website. 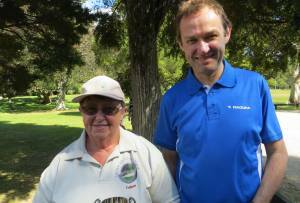 For the second consecutive challenge Masterton retained the Jacques Cochonnet Trophy without throwing a boule. Park Avenue were unable to field a team and so defaulted the match. Masterton's next defence is at home to Manawatu. 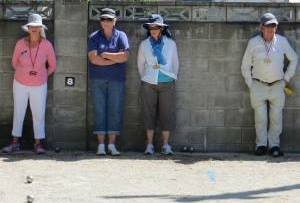 Eighteen teams have entered the Upper Hutt Swiss Doubles this Sunday (16 February). The start time is 9:30 for 10:00 am. 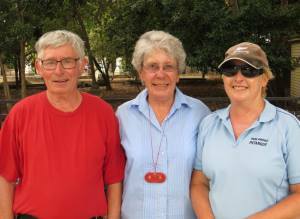 Colleen Horton and Michael Rocks were undefeated in winning the Upper Hutt Swiss Doubles. 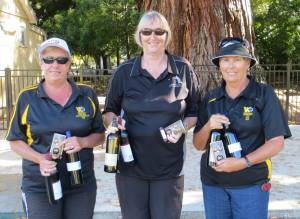 Second place was taken by Jack Gazzard and Lynne Shepherd ahead of Elaine Hunt and Kathy Taylor, and Bob Horton and Jeanne Zee. The Minutes for the 14 February meeting are now available. Sixteen teams have entered the WBS Open Triples this weekend (22/23 February). 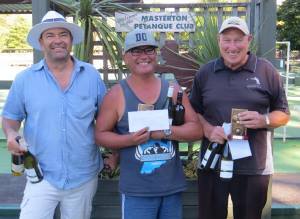 Maurice Belz, Bob Bridge and Lee Taffard won the WBS Open Triples in Masterton. In the Trophy final they beat Barbara Johnston, Shirley MacDonald and Christine Strichen 13-6. Progress score: 0-1, 0-1, 1-1, 3-1, 3-3, 7-3, 7-5, 7-6, 9-6, 13-6. Tweleve Wellington region players have been named in the New Zealand team to play against Australia in Rotorua next month (22/23 March). 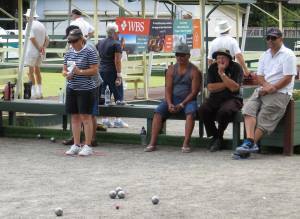 The Trans Tasman match is played in an Open division and a Senior (Over 60) division. 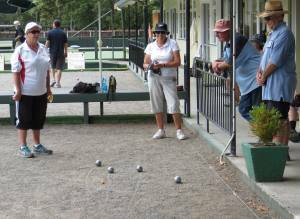 New Zealand has dominated both divisions in recent years and will hoping to win both divisions for the seventh consecutive year. Coaches have yet to be named. Annick Le Guen, Angela Maxted and Ros Morton are all making their international debut. 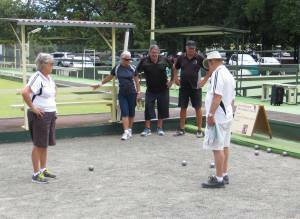 The Australia team to play against New Zealand in the Trans Tasman match at Rotorua Pétanque club. The Senior Coach is Adrian Clements. When shooting the cochonnet the points awarded have reverted back to the pre-2008 rules for the World Championship Shooting competition. In figure 5, if you touch or move the jack and it does not leave the circle then three points are awarded. 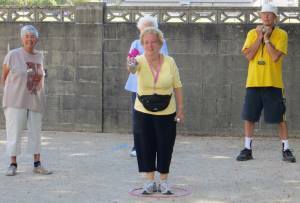 In 2008, this was changed to 1 point if the cochonnet was touched and did not leave the spot and three points if it moves but does not leave the circle. The change will make it easier for the Arbitre to allocate points. There have been some additional rule tweaks for competitions and an updated English version of the rules are expected shortly. The rules can be found on the FIPJP website.